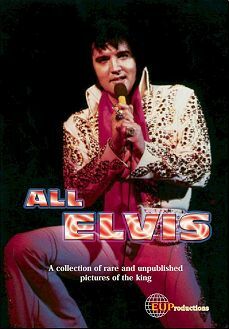 "All Elvis" is Elvis Unlimited fourth book and contains more than 200 pictures of Elvis on stage, in private and in the studio etc. Several of them are unpublished before. Spanning from 1955 to 1977 the pictures are found on 80 pages, several of the photos are black and white, though most of them in colors. Produced in 2002 copies, the price is as low as 149 DKK or $ 18. As mentioned you will find several rare pictures and even some never before published. The foreword is from an interview Henrik Knudsen had with Tom Jones, then 50 pages of mostly off-stage pictures. Finally 30 pages of on-stage 1970's pictures. Unfortunately none of the photos are given any date or photo-credit. The format is letter 8 1/2 x 11 in soft cover. Given the rather nice price I would recommend this book. Value for money! © Oven Egeland, Elvis In Norway, 2002.